During the cover of night, Yoo-Bang (Lee Beom-Soo) enters a dark villa with a flashlight. Yoo-Bang finds a man Ho-Hae (Park Sang-Myeon) dead, slouched over on a chair, and a woman Yeo-Chi (Jung Ryeo-Won) hiding behind a curtain. At Ho-Hae's funeral, detectives enter and arrests Yoo-Bang and Yeo-Chi for the murder of Ho-Hae. 3 months earlier. The president of Chunha Group, Jin Shi-Hwang (Lee Deok-Hwa), orders his granddaughter Yeo-Chi to take business administration training. The grandfather doesn't believe his son Ho-Hae is good enough to run the company. But, Yeo-Chi isn't interested in taking business administration or running a compnay. Yeo-Chi is arrogant and doesn't care about other people. Chunha Group has been developing a new medicine and it is now in the trial testing stage. Meanwhile, the president of Jangcho Company, Oh Ji-Rak (Kim Eung-Soo) hears that rival Chunha Group is developing the new medicine. In order to steal information on the new drug, a director from Jangcho Group, Hang-Woo (Jung Gyu-Woon), goes undercover and applies as a candidate for the trial drug test. 30 applicants are on a bus ready to be taken to a secret location where the medical drug test will take place. Chief Researcher from Chunhha Group Woo-Hee (Hong Soo-Hyun) boards the bus and takes the applicants cellphones for security reasons. Once the 30 applicants arrive at the secret laboratory, they will be shut off from the outside world for 10 days (the amount of days the experiment is to take place). During the drug trials, Yoo-Bang notices a suspicious act done by Hang-Woo. Yoo-Bang and Hang-Woo stay in the same room during the tests. Hang-Woo attempts to steal the medicine from the drug trials, but it's extremely difficult due to the heavy level of security used. Suddenly, Yoo-Bang begins laughing and can't stop. The other applicants also begin to show abnormal behaviors. Researchers conclude that unusual behaviors are a side effect from the new drug. The director of Chunha Group Jang Ryang gives an order not to let the company president Jin Shi-Hwang know about the strange side effects. Meanwhile, Hang-Woo records the strange behaviors with a video recorder attached inside of his eye glasses. 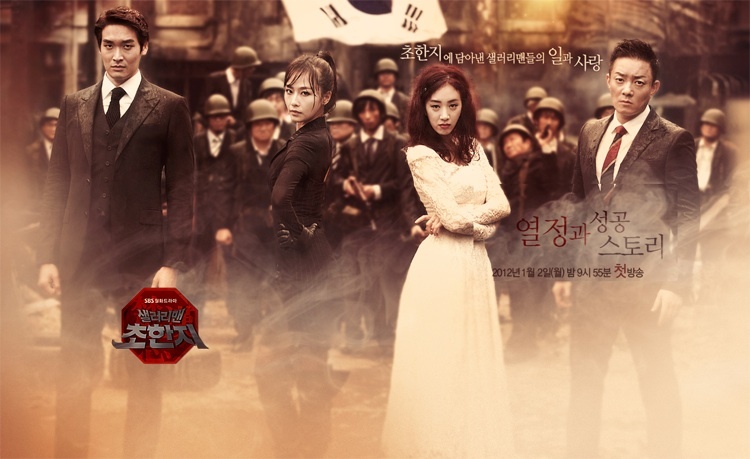 "History of the Salaryman" takes over the SBS Monday & Tuesday 21:55 time slot previously occupied by "A Thousand Days' Promise" and followed by "Fashion King" on March 19, 2012. Filming begins November 17, 2011. Himsa Jan 28 2019 3:03 pm ok, maybe incarnation of money too! Himsa Jan 28 2019 3:01 pm one of a kind, one of a! Inmyheart, dr Oct 19 2018 10:06 pm I watched this bcos of le beom & jung ryeo won & also bcos of the reviews & ratings. I am not saying that the story is not good... just that some premises of the story & plots were at times bordering on total lack of human sense. Nice story initially but some parts are ludicrous & totally devoid of common sense. This story tried its best to show Human greeds in many ways override simple common sense. What i have found deplorable the most is not mo ga bi but the relationship between woo hee & han woo. How one is blinded in his pursue of revenge that all his acts were really a demonstration of one’s objective would justify any means...however manipulative & mean those can be! I truly wonder how can that be a true reflection of a good heart???? Worst of all that woo hee girl...totally no sense...withstanding her lover’s absurd & wretched acts towards her friends whilst knowing that those were wrong! Really truly absurd!!! Only at the end she started to have some common sense over the whole matter. The second lead actors....they must have carried out their roles really well....however pathethic the 2 roles may seem lol..
Other than that....especially the main leads & the casts were simply daebak amazing. So if you can fall for the lackings in the second characters’ role in this story...watch this drama bcos the other parts were really great to watch! Arihant May 17 2018 8:04 am Superb show !!!! Started this randomly as was in a mood to catch a business show again as had liked Midas a lot.I didn't know most of the main cast here except Jung Ryeo won.Ended up liking all the main cast esp.Lee Bum Soo as the titular Salaryman.I liked the second female lead more as her character seemed better suited to the male lead. The show is a glorious underdog story and ends superbly.The director and writers have done some of their best work ever.The OST is one of the best ever with the instrumental pieces elevating the proceedings to another level! It is funny,warm,suspenseful and romantic at the same time.If you like shows that surprise you, don't miss this! Edede Dec 18 2017 11:06 am didn't know what to expect when I first started watching this show.. but I truly didn't expect it to be this good! The plot is awesome, every episode keeps you in suspense. The acting and chemistry between the cast deserves a standing ovation. They are so so so damn good! The character development is really great. You don't know who to like and who to dislike. One episode you'll think Hang Woo is horrible but the next you think he's adorable. Same for Yeo Chi, Chairman Jin and Director Mo. Your feelings for them just changes everytime! 22 episodes is just right and they wrapped everything up so well. They deserve the high ratings cos this is just too damn good! Jung Ryeo Won amazes me with her acting. I came from "Witch in Court" cos I also didn't expect her to be so good in acting. She was so-so in MNIKSS so I truly didn't think that she would be this good of an actress. When she was with Yoo Bang and she cried cos she was so frustrated with Director Mo... T_T Heartbreaking..
Anyways, give this drama a watch!!! shin Dec 04 2015 8:47 am lee bum soo daebaaaaak...what a great actor!!! joo Aug 19 2015 1:07 pm one of the best and funniest dramas around! Lindsay Jung Jul 18 2015 5:43 am Wow the ratings are so high. Didn't expect it as I've never heard of this drama before. I just stumbled upon Jung Ryeo Won's role in a website earlier this week. Will start watching it today, seeing the ratings it must be great. Bubble Jan 26 2015 12:53 pm i have already watch half of the drama but already dont like yoo bang character. Kaziu Jan 30 2014 7:04 pm ASTOUNDING DRAMA! If you are hesitating about watching it, give it a couple episodes and you will get addicted! A must watch! It's smart, serious, and hilarious all in one. Very tastefully written and acted out. Definitely one of the best Korean dramas I watched. So outside the box. The characters and story line were amazing. Very easy going episodes with so many twists and turns. You couldn't anticipate what will happen next at all. Not mentioning the short stories at the end of each episode. They were so funny I literally cried. kathy Jan 18 2014 8:46 am One of the best ... my type of drama ... hilarious ... power packed cast esp Lee Beom Soo, Jung Goo Woon & Jung Ryeo Won! seren Oct 29 2012 8:39 pm I can't for the life of me understand why I watched this drama so late. After months of overlooking it I finally decided to give it try and I was hands down blown away. Perfectly cast characters, skillful writing, and the sheer badassness that is Yoo Bang-- 2012 has been THE year for dramas but this one stands in a league of its own. gi May 05 2012 4:06 pm I love this drama. It was written by the same author as Giant, a winning combination of also the same actors mostly. It had pretty high ratings in Korea, which os a relief to know this was a seriously good drama, very refreshing and Lee Bum Soo as always delivers, I love the guy. loyalfan_1 Apr 27 2012 4:05 am Ryeo Won Jung believes in just one thing. "I can do it". She stands firm like a candle in the dark scaling off all the obstacles to become the winner. loyalfan_1 Apr 19 2012 6:47 am Excellent peformance Ryeo Won Jung. She walks in places that no one has ever walked. She creates a history for herself in this awesome drama. Her works and efforts will be known all over the world. She is the best. loyalfan_1 Apr 10 2012 6:24 am Want Salaryman to be 100% in ratings. The best drama of year 2012. Want to see Ryeo Won Jung on the red carpet with awards in her hands. Love her red hair. Impressive performance. She rules in this most beautiful drama. loyalfan_1 Apr 06 2012 11:42 am Ryu Won Jung has incredible acting skills. She is Korea's precious diamond. She is just gorgeous with a beautiful smile. Her beautiful personality makes her even more beautiful. She must come back in another romantic historical drama real soon. Just love her cuz she is Ryu Won Jung. Tina05 Feb 25 2012 7:09 am Hong Soo Hyun looks different in here...She looks natural. Good luck for all the cast !! chocosluvme Feb 20 2012 7:45 am its awesome this drama freakin awesome every eps is absolute refreshing ahh 6 eps more to go before its ended Yoo Bang and Yeo Chi is such a wonderful weird combination couple Hwang Woo and Woo Hee offers smashing hotness ooo la la.This drama gonna be a perfect textbook for future reference its funny yet classy at the same time with a very fresh approach not to mention the best casting.If you think JRW is mediocre once you see her as YC you'll stunned of how well she grasp the character darn her character is absolute rebel from the start and her pairing with LBS really works even if they still in one sided love stage right now gosh YB better start feeling towards YC already ahh the waits .... anyway give salaryman a chance you'll see my points and do not judge a book by just looking at its cover because the content might surprised you! BUt if you're not interested then its individual choice me i am just a Kdrama fan. jang yu Jan 31 2012 6:16 pm casts are very known from previous popular dramas like Giant, Loving You a Thousand Times, Lie To Me, Glass Castle etc. But the hero is the most popular Lee Beom-Soo aka Lee Gang Mo , Oh Yoo-Bang :-). kualalumpur Jan 25 2012 9:24 am i like 1st episode very much plus they had so many cast from 'GIANT' :D !!! loyalfan_1 Jan 19 2012 11:45 pm Jung Reo Won is still my favorite actress although there are many comments about her. Her wonderful personality just shines. Moreover she is so beautiful and soft spoken. I love watching her drama because she is funny sometimes. Her dramas are so interesting that the viewers are stuck to their seats and asking for more. glace Jan 07 2012 1:54 pm Jung Ryeo Won is really impressive here! Such a different character. And she looks very healthy...much better than KSS days.